Since 1962, family-owned Forge Products Corporation has produced premium open die forgings for industrial customers across America and around the world. Located near major freeways, airports, rail yards and the Port of Cleveland, Ohio, the company employs a talented crew of metalworkers cross-trained and focused on quality with an average tenure of 20 years. Charles (Chuck) Thayer shares the same name as his father, but as a child he believed the two had little in common. During a childhood visit to the Cleveland, Ohio forge shop where his father worked, he said, “I remember thinking, this is one place you’ll never catch me.” The memory often makes him laugh: Mr. Thayer is now President of Forge Products Corporation, the company he and his father started in 1962. Initially focused on the statewide need for machine tools, Forge Products grew steadily over the years, successfully entering new national and international markets to serve diverse industries. The growth led to a series of four moves, each representing another investment in the city of Cleveland. Located at 9503 Woodland Avenue since 1977, the company built a new, two-story office addition in 2012. Expansive upgrades in equipment and quality improvement have resulted in a core of loyal customers who have stayed with the company for a generation or longer. 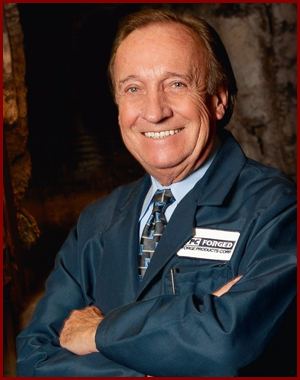 Family-owned through three generations, today, Forge Products features two generations of the Thayer family on staff. And it’s not unusual to find an employee on the shop floor with 25 years tenure at the plant or more. The company marked its 50th anniversary in 2012.